This spacious East End condo has been a super hit for now several seasons! Located in the fashionable Art Gallery District of town, just steps away from Commercial Street is this very spacious two story unit. It features a full kitchen with all appliances, a gorgeous private patio deck, parking for one car, TV, DVD, WiFi, washer & dryer, and everything you make need for a great relaxing or fun time in P-Town! The condo has been partially updated each year and has new linens, towels, draperies, and upgrades, including a four zone a/c system throughout. Small pets no problem. Either wood or tile floors throughout. Just let us know. This is a non-smoking unit and has no carpeting for those with allergies except in bedrooms. Lots of light to bring the outside in. Situated on a quiet flower garden street. See feedback from past tenants! Dappled shade with blooming flowers and foliage on the outside, warm and cozy on the inside. A wonderful, quiet retreat in the city, not far to walk to great restaurants or stay in and cook your own gourmet meal right from the sea. Owner is very accommodating and the neighbors are wonderful. With or without a car, the included parking spot is a gem sought after. I appreciated the 1 full bathroom on the second level and the half bath on the main level. A fireplace is nice on chilly nights, or sit outside for the warm starry nights. Come and stay and make your own memories in this garden tranquility retreat in the city. Second time staying here and could not be more pleased. Private and quiet with everything necessary for a comfortable week. This condo was charming and serene. The perfect place for our stay. 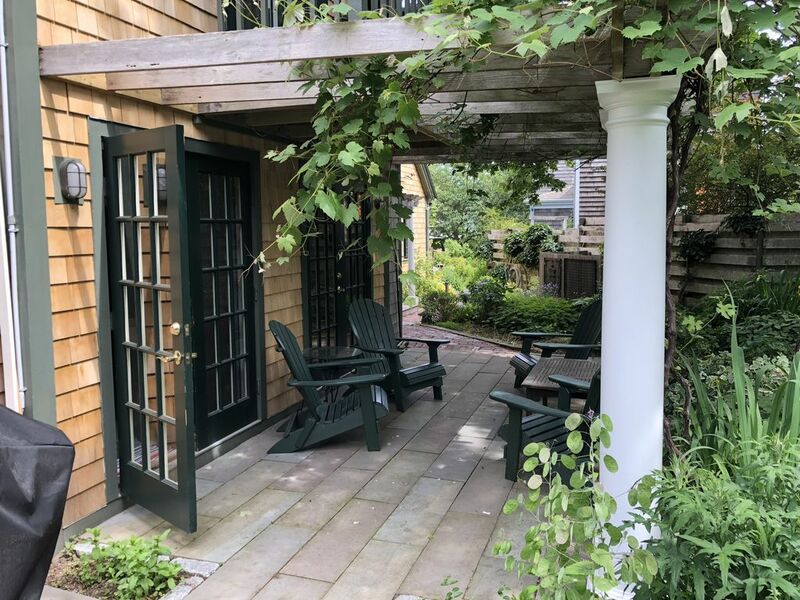 Being in Provincetown is always a joy, but as a writer married to a writer, with events scheduled most of the week, a quiet retreat like this was a joy. Stan was very kind and considerate, making sure we had all we needed. It’s a lovely home. Thank you so very much on this nice review. Glad that your stay was pleasant and the weather was nice too. Nice meeting you both and your friend from the UK. I look forward to your visit possibly next year! We spent a week in August at this great 2-bedroom rental property in the heart of the east end. The setup is very comfortable with a large-ish dining room, kitchen and half bath on the first floor and living space, bedrooms and full bath on the the second. In addition to the interior, there is a patio area with a lovely garden and 2 small balconies (one off the living room and the other, larger one, accessed via a bedroom. The unit is dog friendly and provides deeded access to the harbor beach. The unit is very easy to get to by car since it is on the less congested east end. The manager, Stan, was very welcoming and helpful and provided immediate answers to any questions we had. The kitchen was large and well-stocked with equipment for us to prepare full dinners and to entertain both dinner and sleep over guests. The appliances all seemed on the newer side and operated easily. The outdoor shower took some time to get warm water but was large and spacious. The first floor's second bathroom was very welcome with additional guests. There was plenty of closet and storage space for clothes and beach supplies. Each bedroom also had it's own sink and reduced bathroom traffic (as did the half bath) and plenty of additional linens. The full-size beds were comfortable (and fit the room dimensions) they might be limiting for larger folks. The upstairs living room was very comfortable and comes with both a flat screen TV and stereo, although we used neither. Overall, we were very happy with the rental and look forward to staying there in the future! Perfect location - quiet - comfortable. We really enjoyed our stay. You are right in the center of all activity but you felt like you were staying in a quiet secluded street. We had everything we needed. Thanks so much. Keep coming back year after year! Everything included! Not one need unmet! Historic fishing village turned to festive, fun, relaxing community with live theater, whale watching, dune tours, most beautiful beaches, boating & much more. An area of a carefree & liberal lifestyle with numerous restaurants, boutique shops, drinking establishments, & more. The East End features the Gallery District with world famous art and a world class museum. Begin days on the beaches and stay out to wee hours of fun in the evening. Utilities included $250.00 refundable security deposit, all rents due by June first of each year. For further details contact Stan Sylvain for more details.